The Italian tenor is back again - after last year's stellar Opera album, Andrea Bocelli is about to set hearts aflutter with 'Passione', an album of romantic classics inspired by Bocelli's early days, singing requests in bars. It includes duets with artists like Jennifer Lopez and Edith Nelly Furtado, as well as a virtual duet with Edith Piaf. To say that romance is a key theme on Passione would be something of an understatement, so Bocelli kicks off with this free-sounding little jazz number. Not only has it been covered by an incredible list of jazz greats (Charlie Parker, Glenn Miller, King Tubby and more), it's also featured heavily in the classic movie Casablanca. A gentle bossa groove is not what we've come to expect from Andrea Bocelli over the years. But this is exactly what we get on this song, composed by legendary Italian film score maestro Armando Trovaioli. The title translates roughly as 'Rome, Don't Fool Me Tonight', and the song is all about setting the right mood for romance. Bocelli's resonant tenor is the focus on this hymn to the bubbly stuff. A cover of Italian singer Peppino di Capri's original, it's unsurprisingly romantic, but rather more glossy than the original. The arrangement is sparing until the final section, when it erupts into a superbly cheesy accordion and string-laden climax. There's something rather Jacques Brel-esque about the intro to this dramatic song, but it soon develops into a nimble little pop song. You can just imagine the young Bocelli singing this one to a packed bar in Italy, perhaps to some celeb friends like Julie Andrews and Isabella Rosselini...? Or, to give it its English title, Perhaps Perhaps Perhaps. This is an unlikey but rather inspired choice of duet. Lopez's sultry vocals form the perfect counterpoint on this sleek tune, and her pop credentials need no introduction. Bocelli sounds like he's having a ball. Another staple Italian pop song that Bocelli no doubt picked up in his youth, this showcases just how versatile he has become as a performer. It's not all just 'Nessun Dorma', y'know. Now, here's a word you wouldn't normally associate with Andrea Bocelli: samba! But it works - after the spoken-word intro, Bocelli slips into a rather relaxing loose groove and brings a ray of sunshine to the record. This is a novel idea: Bocelli duetting with the recorded voice of the late, great Edith Piaf. By this point in the album we've settled into the idea of Bocelli as a romantic crooner, and Piaf's voice makes a perfect partner. A little bit of something you'll know, but delivered in a unique way. Another surprising duet, this time with the Canadian pop starlet Nelly Furtado. Any accusations of 'popera' are most definitely unfounded by this point - this is simply the sound of an outstanding tenor going back to his roots. With added sax, obviously. Bocelli has tackled this romantic little delicacy before, and in this version it's a hushed piano ballad that gradually builds to a typically string-heavy end. The music of singer and actress Dalida is not one much recognised in Britain these days, but across the channel and throughout mainland Europe she was hailed as one of the most important divas in music - this song, ably handled by Bocelli, shows exactly how good she was. No collection of romantic classics would be complete without The Girl From Ipanema, and this version even sees Andrea giving us a bit of a whistle as well. As part of the huge tradition of Neapolitan songs that emerged in the 50s and beyond, this song (written by the actor Antonio de Curtis) is undoubtedly one that sees Bocelli go back to his roots - a fine way to finish one of Bocelli's most interesting albums to date. 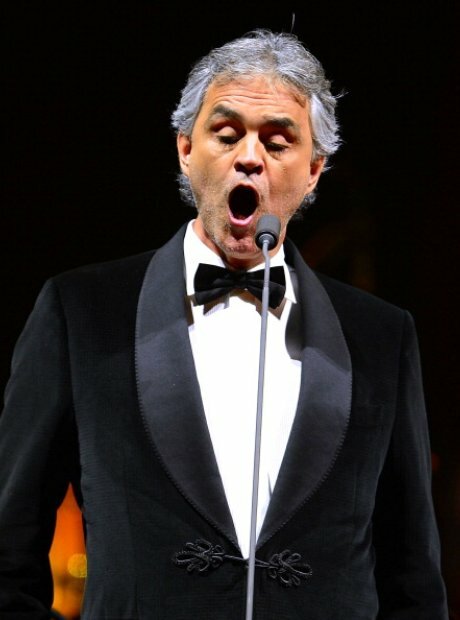 There are few singers who could convincingly breathe new life into an Elvis song, but Andrea Bocelli's tenor is quite the remarkable instrument. And what better song to finish this romantic album with than one of The King's most quiet and honest numbers, Love Me Tender? Can Andrea Bocelli beat Tom Odell and Lady Gaga to No. 1?